Quixote pomade, name chosen by its brewer Amilcar Cifuentes, after the Spanish novel ‘Don Quixote’ by Cervantes. In short: Alonso Quijano calls himself ‘Don Quixote’ loses his mind and thinks he is a knight. He is very confused and acts crazy. Quixote pomade is located in Sacramento/CA. Amilcar brings various handcrafted pomades in the light, medium, heavy and super heavy range. He creates oil based, wax based, water based pomades plus a clay. He even made a light unorthodox water based pomade, these are rare thus a good addition. Amilcar makes other stuff too! Additional material: interview with Amilcar Cifuentes by Mike Smith from the YouTube channel ‘Modern man TV’. Link: https://www.youtube.com/watch?v=MW4JwC9Iv2E. Check out this guy’s other reviews! He does a great job! Pomade I will be reviewing, is Amilcar’s oil based heavy hold. Comes in a metal tin with 3.2 oz of pomade. It has a twist top lid. On the front of the tin, there’s Quixote himself with the name of the company, hold and type of pomade with the Quixote slogan. On the backside: directions, ingredients and info on the brand plus safety info. The pomade is light yellow. Candelilla Wax, Beeswax, Hydrogenated Castor Oil, Carnauba Wax, Petrolatum, Coconut Oil, Vitamin E Oil, Fragrance. A candelilla wax based pomade: something we don’t see often. One I can remember is: Tazmaneian tame, last year with a limited heavy hold. We come across a bunch of waxes that will provide the pomade its heavy hold. Hydrogenated castor oil is also a wax, namely castor wax. Many will think this is a very waxy one. We’ll talk about that later. You have lots of options here! Amilcar offers scents for every nose! He offers scents made from essential oils and/or fragrance oils. I have the citrus cologne (fragrance oil). It smells like citrus 🙂 with a bit of a chemical note (cologne). It is not one of my liking. Next time, I’ll just order another scent. Scent in the jar: rather tart. Once in the hair, you will get whiffs now and then. Application: to damp hair to tame my waves and for easier application. I needed 3 scoops, average sized. Scooping out: since it is a heavy, it will be a hard to scoop out. The pomade was spinning around in the tin because of the waxy top layer. Did not need the back of my nail to remove product. Once you’ve scooped for the first time, it’ll be easier to take further licks of the top. It is softer beneath. Breakdown: be aware to take small scoops at a time. There’s a lot of wax so you get beads, clumps. This is normal as it has a high wax content, so don’t shoot the brewer! When taking smaller scoops, it will break down alright and will be easy to apply. You sense a waxy consistency that becomes soft and creamy after a few solid rubs. No real stickiness or dryness here. Working in: there’s a slight amount of tug and pull but very workable, doable for a heavy. You’ll notice right away it has some decent shine. Combing back: I make use of a special brush to avoid tugging and pulling: an air motion brush. Google it, you will find info: recommended equipment in my opinion. Using this brush gives me a comfortable experience. Combing with other brushes will be okay for this pomade is very user-friendly. The pomade is easy to distribute evenly. Switching the mop’s direction to part went alright as well. Control: immediate control! 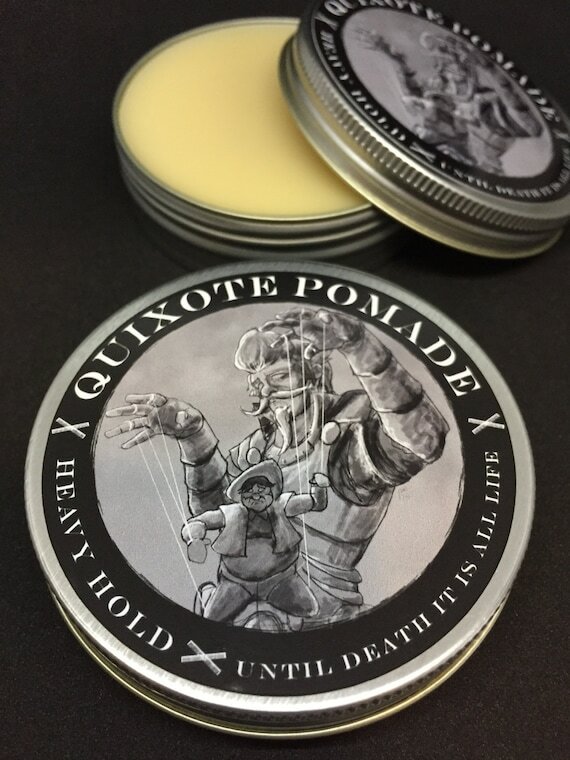 Don’t expect Quixote heavy hold to be a very waxy pomade that rips out hairs. Don’t expect a pomade that forces the hair into a certain direction and after a few seconds it will bounce back, jump up as many waxy pomades do. No, Quixote works nicely, it has some good slickness. Every hair was laid down perfectly and even my cowlicks (after an extra small lick) participated well. It was easy to lift my front without waves showing through. For a heavy, there’s some good slickness. No fight with stray hairs. I got myself some good height and shape. Impressed! Weight: towards a medium weight. It does not weigh down the mane at all, some proper volume is possible. Styling time: rather fast. Styles comfortable. Initial results: everything looked very well and clean. Results after 30 minutes: no splits, no loose bangs, no sag = impeccable. For a heavy hold, it provides you with decent shine = around a medium I would say. That’s a big plus! Described as a heavy hold. Yes, a very comfortable firm to me. It acts like a medium and holds like a firm/strong hold. This is a perfect pomade for me! Endurance: tested in relatively warm weather (about 70), no heavy-duty, lots of sweating. My hair held its overall shape! Amilcar used several waxes to keep everything together for the hot summer weather. Since he lives in California, I can fully understand why. No hassle. You can recomb facile. Hair keeps its good hold and shape. For me: I wet my hair, apply some tonic, a few licks on top and style. Build up is clean, easy to work with. I didn’t need that much pomade the next days. About 3 rounds of shampoo. I put conditioner and shampoo on my pomade ‘dry’ hair and let it sit for around 10 minutes. Then I rinse. Shampoo, rinse and all was out. Grand classic grooming co, heavy hold oil based. Big slick, heavy hold oil based. Lockhart’s goon grease, heavy hold oil based. Quixote heavy hold is a great, very balanced, refined pomade. It works like a medium: comfortable, agreeable, easy and holds, endures as a good firm should do. I used his water based heavy in the past and this is top-notch as well! On top of that, you have the possibility to choose between several scents. In my opinion Quixote deserves as much recognition as: Lockhart’s, Flagship, Tremolo’s, Shear revival, O’Douds, Nostalgic grooming, Pomps not dead, Big slick, … . Get yourself a tin of magic!